On Monday night, multiple UCLA and Notre Dame recruiting sites reported rumors that five-star defensive tackle Eddie Vanderdoes may be parting ways with the Irish. Placer football coach Joey Montoya affirmed Vanderdoes’ academic eligibility, and praised his character as well. Regardless of reason, he seems set to leave the Irish before even arriving in South Bend. Given that Vanderdoes was the biggest recruit UCLA missed on, securing him would be a major coup for a defensive line that was banged up through spring practice. Though he’s primarily a 4-3 tackle, the 6-foot-3, 310-pound prospect could also play as a 3-4 end. Well, that’s … bold. Adidas introduced daring new alternate looks for six basketball programs Tuesday, continuing what’s become a norm in college athletics. 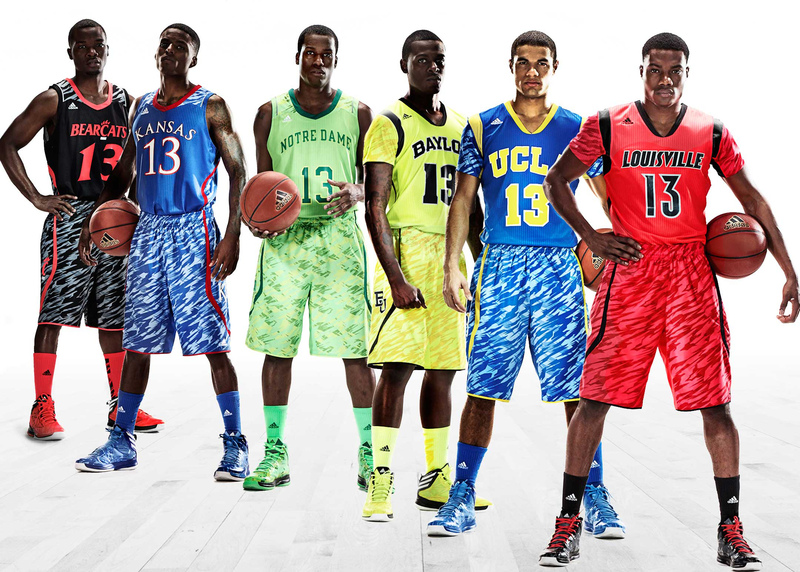 UCLA will be among those donning camouflage-patterned shorts, joining Baylor, Cincinnati, No. 21 Notre Dame, No. 10 Louisville, No. 6 Kansas. UCLA, Baylor and Louisville’s new alternates also feature camo sleeves. The Bruins last attempt at an uniform change didn’t go very well, using an all-blue look during a home overtime loss to USC. They’ll wear this latest edition at least once during the Pac-12 tournament. UPDATE: A UCLA spokesperson said players were presented with uniform concepts in advance and loved them. Do you like the camo look? UCLA misses on the five-star defensive end. Notre Dame blew the secret a little bit when it accidentally included Eddie Vanderdoes on its recruiting program — despite the Placer High product not having announced his decision. Click through to join a live chat for the BCS Championship game, up and running at 4:30 p.m.